Home - Linux - Lubuntu - Ubuntu 16.10 Yakkety Yak - Ubuntu Derivate - Ubuntu Gnome - Ubuntu Kylin - Ubuntu MATE - Ubuntu Studio - Xubuntu - Disponibile per il download Ubuntu 16.10 Yakkety Yak e derivate ufficiali. 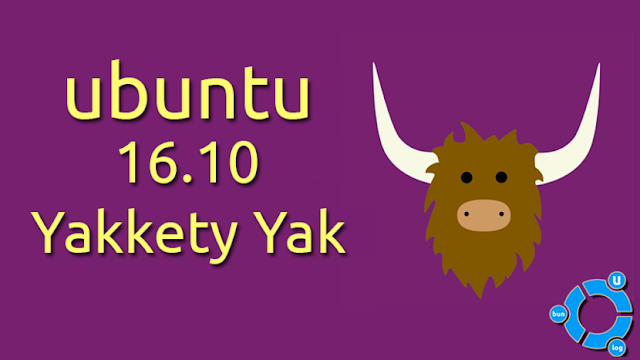 Disponibile per il download Ubuntu 16.10 Yakkety Yak e derivate ufficiali. È stata rilasciata la nuova versione 16.10 Yakkety Yak di Ubuntu. Canonical ha rilasciato la sua ultima versione di Ubuntu. Ubuntu 16.10 Yakkety Yak sarà supportata solamente per i prossimi nove mesi fino a luglio 2017, ed integra il nuovo ambiente desktop Unity 8 in modalità technical preview. L'utente potrà selezionarlo dalla scherma di log-in, ma Unity 8 non sarà ancora il nuovo ambiente predefinito della celeberrima distribuzione Linux. oppure http://www.ubuntu-it.org/download (si consiglia lo scaricamento tramite .torrent). Per qualsiasi versione se non state usando una LTS, oppure Per le versioni LTS se si sta usando una LTS. Infine, premere la scorciatoia da tastiera ALT+F2 e digitare update-manager e seguire le istruzioni a schermo. Leggi anche: Strano e criptico il nome scelto per Ubuntu 16.10: Yakkety Yak. Arriva puntuale come da roadmap il tanto atteso rilascio della nuova release di casa Canonical. Sono quindi pronte disponibili per il download e l’installazione le ISO ufficiali di Ubuntu 16.10, Kubuntu 16.10, Ubuntu GNOME 16.10, Ubuntu MATE 16.10, Xubuntu 16.10, Lubuntu 16.10 e Ubuntu Kylin 16.10 (la variante cinese di Ubuntu). Canonical has announced the release of a new version of its popularUbuntu operating system. The latest version, Ubuntu 16.10, offers users many updated packages, a preview session of the Unity 8 desktop environment and version 4.8 of the Linux kernel. The distribution also features LibreOffice 5.2 and the update manager application now shows changelogs from enabled personal package archives (PPAs). "Network performance is a primary focus of this release, with updated versions of Data Plane Development Kit (DPDK), OpenVSwitch (OVS) and virtualization technologies, all able to handle critical application traffic for lower latency and greater throughput. Ubuntu 16.10 and the corresponding updates to Ubuntu 16.04 LTS further enhance Ubuntu’s position as the leading private cloud infrastructure operating system, with OpenStack Newton, DPDK, enhanced OpenVSwitch and LXD machine containers alongside regular KVM based VM guests. Ubuntu 16.10 previews Canonical’s device convergence vision." Further information can be found in the distribution's release announcement and release notes.Download(pkglist): ubuntu-16.10-desktop-amd64.iso (1,520MB, SHA256, signature,torrent),ubuntu-16.10-server-amd64.iso (668MB, SHA256, signature, torrent). Martin Wimpress has announced the launch of Ubuntu MATE 16.10. The new version of this official Ubuntu community edition offers a desktop environment and applications which have been ported to the GTK+ 3 toolkit, replacing GTK+ 2. "Ubuntu MATE 16.10 is, more or less, a re-working of Ubuntu MATE from scratch, not just to accommodate GTK+ 3 but to also make most of the packages shipped by default with Ubuntu MATE 'Recommended'. This means most default applications can now be uninstalled without issue. The work to port MATE Desktop to GTK+ 3 has been ongoing for a couple of years and Ubuntu MATE is the first major distribution to ship a full GTK+ 3 implementation of the MATE Desktop. And the absolute latest release too, MATE Desktop 1.16! Firefox and LibreOffice are also GTK+ 3 only in Yakkety. This has been no small undertaking, we've changed toolkits twice this cycle. First from GTK+ 2.24.x to GTK+ 3.18, and then again to GTK+ 3.20. The themes required two significant upgrades during this process." Additional information and a list of changes can be found in the project's release announcement. Download: ubuntu-mate-16.10-desktop-amd64.iso (1,635MB, SHA256, signature, torrent, pkglist). The Xubuntu project has released a new version of the project's Xfce-oriented distribution. The new release, Xubuntu 16.10, shares a package base with Ubuntu 16.10 and will be supported for nine months. The new version of Xubuntu features Xfce desktop packages built with the GTK+ 3 toolkit, which replaces the legacy GTK+ 2 toolkit. "The Xubuntu team is pleased to announce the immediate release of Xubuntu 16.10. Xubuntu 16.10 is a normal release and will be supported for nine months. This release has seen little visible change since April's 16.04, however much has been done towards supplying Xubuntu with Xfce packages built with GTK+ 3, including the porting of many plugins and Xfce Terminal to GTK+ 3. Those GTK+ 3 ports can, if one wishes to test them, be installed from one of the team's development PPAs. Known issues: Thunar is still the subject of a few bugs, though they all appear to revolve around similar issues; on some hardware the password is sometimes required twice when returning from suspend." Further details about this release, along with a list of known issues, can be found in the project's release announcement andrelease notes. Download: xubuntu-16.10-desktop-amd64.iso(1,234MB, SHA256,signature, torrent, pkglist). The Kubuntu development team has announced the release of Kubuntu16.10, the latest version of the distribution that combines the Ubuntu base system with the KDE Plasma 5 desktop: "We, the Kubuntu team, are very happy to announce that Kubuntu 16.10 is finally here. After 6 months of hard but fun work we have a bright new release for you all. We packaged some great updates from the KDE community such as: Plasma 5.7.5, Applications 16.04.3, Frameworks 5.26.0. We also have updated to version 4.8 of the Linux kernel with improvements across the board such as Microsoft Surface 3 support. Plasma 5, the next generation of KDE's desktop, has been refined to make it smoother to use while retaining the familiar setup. The 7th set of updates to Plasma 5 is the default in this version of Kubuntu. Combined with KDE Frameworks 5.26.0 the Plasma 5.7 desktop brings improved workflows, rewritten and improved task manager and system tray...." See therelease announcement and the release notes for further details and screenshots.Download: kubuntu-16.10-desktop-amd64.iso (1,525MB, SHA256, signature,torrent,pkglist). Ubuntu Kylin, a distribution designed primarily for the Chinese-speaking market, has been updated to version 16.10: "We are glad to announce the release of Ubuntu Kylin 16.10, code name 'Yakkety Yak'. In this release, we have fixed many internationalization and localization bugs in Ubuntu itself and bugs in software written by the Ubuntu Kylin team. Changes since 16.04: this release is based on 4.8 Linux kernel; the core applications have been updated to their latest versions - Firefox 49, Thunderbird 45.3, LibreOffice 5.2, Chromium 53, Nautilus (aka Files) 3.20; we have also released Sogou Pinyin 2.0.0.0082, it is not included in the image by default, but you can install it easily from the Ubuntu Kylin Software Center. Besides a plethora of bugs fixed in this milestone, several Ubuntu Kylin specific packages have also been updated." See the release announcement (in Chinese) and the release notes (in English) for further details, screenshots and known issues.Download the live DVD image from here: ubuntukylin-16.10-desktop-amd64.iso (1,511MB,SHA256, signature, torrent,pkglist). Lubuntu 16.10 has been released. Lubuntu is a variant of Ubuntu with the lightweight LXDE as the preferred desktop. From the release announcement: "Thanks to all the hard work from our contributors, Lubuntu 16.10 has been released. With the code name Yakkety Yak, Lubuntu 16.10 is the 11th release of Lubuntu, with support until July 2017. We even have Lenny, the Lubuntu mascot, dressed up for the occasion. Lubuntu is an official Ubuntu flavor based on the Lightweight X11 Desktop Environment (LXDE) specifically targeting older machines with lower resources, but it also runs great on newer hardware. What's improved since 16.04? We now ship with Linux kernel 4.8; general bug fix release as we prepare to switch to LXQt; LXDE components have been updated with bug fixes; the artwork has received an update. Unfortunately, we could not get LXQt ready in time for 16.10, so Lubuntu 16.10 ships with LXDE." See also the release notes for further details.Download: lubuntu-16.10-desktop-amd64.iso (898MB, SHA256, signature, torrent,pkglist). Ubuntu Studio 16.10, a brand new version from the project developing a Linux distribution targeted at musicians, video producers, graphics artists and publishers, has been released: "We are happy to announce the release of our latest version, Ubuntu Studio 16.10 'Yakkety Yak'. As a regular version, it will be supported for 9 months. Since it's just out, you may experience some issues, so you might want to wait a bit before upgrading. Changes in this release: new default Numix Blue theme; added DGEdit and DrumGizmo; replaced recordMyDesktop with vokoscreen; replaced GNOME Color Manager with dispcalGUI; added Gpick; added Calibre, PDF-Shuffler and Plume Creator; Krita has been temporarily removed from Yakkety Yak 16.10 due to build issues, but should be brought back as an updated version soon, and be installed automatically when upgrading your packages." See the release announcement and release notes for further information and a list of known issues. Download: ubuntustudio-16.10-dvd-amd64.iso (2,720MB,SHA256,signature, torrent, pkglist). Canonical ha deciso di mettere a disposizione degli utenti Ubuntu, del tutto gratuitamente, il Livepatching. Il Kernel Live Patching consiste nella possibilità, tramite il caricamento di moduli del kernel, di fare patching “live” del kernel stesso, senza necessità di riavviare la macchina. Certo, sono presenti delle limitazioni, ma il servizio è lo stesso fornito ai clienti enterprise: un ghost, opportunatamente configurato tramite un token univoco fornito da Canonical stessa, verifica la disponibilità di live patch e si preoccupa di scaricarle ed installarle, attivandole automaticamente e, come detto, senza necessità di riavvio.